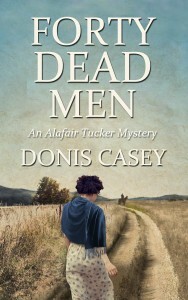 Forty Dead Men is the tenth Alafair Tucker mystery by Donis Casey. This is a wonderful historic mystery series set in Oklahoma. I have read most of the books in this series and enjoyed them all. Forty Dead Men finds the Tucker family at the end of World War I. The flu epidemic is raging so it is not surprising when a dead body is found at the side of the road. It turns out to be the body of a man whose wife G.W. found wandering in the field. Holly, the woman, had come from Maine to find her husband who deserted her after the war. Once Holly looks at the body she realizes the man is someone else. So what happened to her husband? Really enjoyable period mystery. I loved all the twists. Always enjoy Alafair Tucker’s sleuthing. This time she needs to save her son G.W. from a charge of murder. 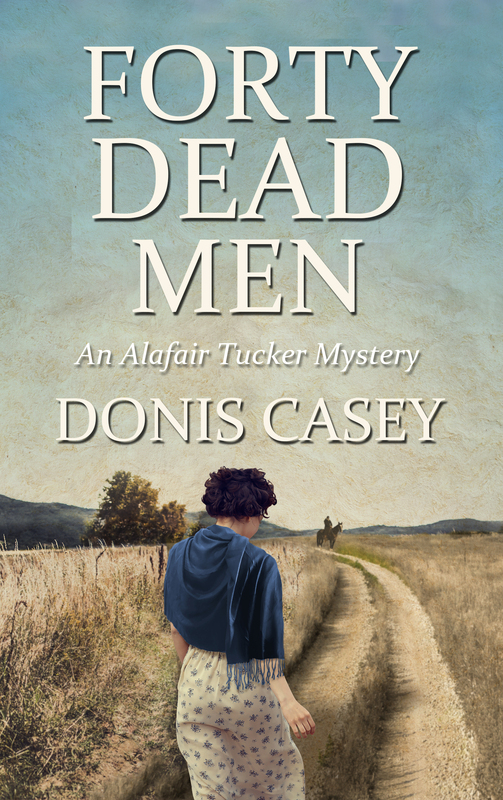 It’s always a stellar day when there’s a new Alafair Tucker mystery to be read, and Forty Dead Men continues this tradition. Donis Casey is a master at crafting book titles that grab a reader’s attention and imagination, and once this newest title is explained, most will feel a little chill run down their spine. Post-traumatic stress disorder is woven deftly into this story in which life on the farm for most of the Tuckers seems completely unchanged by the war. Gee Dub is having difficulties dealing with his experiences fighting in France, and the appearance of a lone woman trudging down a dirt road in the rain gives him focus, a quest. If he can fix what’s wrong with Holly, perhaps he can fix what’s wrong with him. It’s no surprise that the mystery is a good one in Forty Dead Men, and I happen to think that Holly’s runaway husband is one of Casey’s best bad guys even though readers never get to see him alive. (Some men’s deeds certainly live on past their deaths.) But more than the mystery or the fascinating history that can be learned throughout this remarkable series, it’s the cast of characters that keep me coming back for more. Alafair and her husband, Shaw, have ten children. Most of them are grown and have (or are starting) families of their own. Alafair could retire from sleuthing and have many choices among her children for her replacement. Just give her the grandbabies to keep an eye on. In many of the series I read– no matter how much I love them– it feels as though the characters are put in a box and set on a shelf in the closet until it’s time for the next book. Not so with Casey’s Alafair Tucker mysteries. The Tuckers are so busy getting on with their lives that each book feels as though I’m sitting at Alafair’s kitchen table for a cup of coffee and a “catch up” chat. These characters are so alive they practically jump right off the page, and aren’t those just the sort you want to read about?